Before we get started, notice the title of this post. This is why I personally don’t invest in gold. If you’re all about it and want to talk about all the money you’ve made in the last ten years or so in gold, wear it out. I don’t own any gold (save my wedding band) and don’t intend to go buy a bunch (any) of it anytime soon. That being said, I wanted to write this post in response to all the hype in the thousands of ads and storefronts that have popped up touting the value of gold as a great investment (and questions from you guys about why we don’t invest in it). So here are some reasons I think gold investing makes no sense. How do you value it? Unlike a company, gold has no accounts, no profit, no assets, no leadership team, or anything else to look at except price information over time. I can tell what the market price of gold is but I can’t tell you if that’s a good price or a bad one. I can only tell you that’s what the price is today vs. the price yesterday. As someone who likes to invest in something that has a track record I can review and study, this aspect of gold makes me uneasy. What is its utility? Is gold worth something, other than its value as gold? The answer is ‘yes’ but from all my reading it seems only 10-15% of the gold mined in the world today is used industrially. The rest is sold for jewelry and/or investments. Copper is expensive but I understand why – just about every electrician out there uses copper for wiring. You would never do that with gold, even though it has similar properties of electrical conductivity. In other words, if the market decided gold wasn’t important as an investment, gold has no real utility value. There’s no income potential. I don’t necessarily look to invest in something that pays dividends, but many of my investments do. I reinvest all those dividends, which helps quite a bit to increase my return on investment. Gold can’t do that – all it can do is go up/down in market value (and no one can really explain why it does other than speculation). Inflation is certain, but the right hedge against it isn’t. Most of the intelligent arguments out there discuss gold being a good protector against inflation. The best example of history when this played out was Germany’s hyperinflation that occurred between World Wars I and II. During that period, the market price of two things avoided the toll of inflation: gold and…cigarettes. Yep, tobacco rolls were an EXCELLENT investment in Germany during that time. Why aren’t people screaming on the TV and radio for us to invest in Marlboro if hyperinflation is on its way? Pick a disaster…any disaster – This is one Dave Ramsey mentions when someone asks him about gold. The argument FOR gold is that if the money system fails, we’ll return to the days where we’ll exchange gold for goods. Let’s consider Hurricane Katrina (since that’s the example he uses). What was held as valuable? Safe food, drinking water, gasoline and dry/clean clothes topped the list. Gold – who cared about gold? This story has been repeated in Haiti, Japan, etc. when things have gone bad. We’re in a gold boom. We’ve all heard the advice of buy low and sell high. Gold prices are at historical highs – why would we buy it now? As an investment, buying gold when it is at its highest price ever is not very intelligent. Makes sense to me. And when billionaires talk about what they do to make money, I usually try to listen. Thank you for a good article on gold investing. I am hoping that nothing worse happens in our economy but am preparing for the inflation that I believe must come based on historical trends. I can’t eat gold, wear gold or plant gold. I can’t defend myself with gold. I did have a gold watch that never worked right and couldn’t be fixed. I took it to a reputable shop and got 80% of the spot price for the gold. They were up front that they would sell it for more than they paid me. I am okay with that. I left with $135 for a broken watch. I have always thought that if things were REALLY bad, gold would be worthless. People will want food, water, shelter, guns…but what can you do with a gold bar if you’re starving? Thanks for taking the time to write the excellent articles that you do. They are on my weekly “must read” list. You are an excellent communicator with teaching in this area. Thanks also to Stacy for her daily encouragement. You both make a difference in so many lives! Along with other forms of investments we invested in gold and silver and cashed in our gold recently for a 370% profit. You can’t put all your eggs in one basket. Since biblical time gold has been a desired commodity. We paid off our house and are very happy with our investment in the gold. I’m glad it worked out for you. I’d never argue with 370% returns! Like any other investment, if you buy at the right time and sell at the right time, it works GREAT. Our overall look at investing is very long term and relatively low risk. This combination makes gold look pretty scary. I’ve never heard this angle before – well done. I have a bag of old gold jewelry in a drawer that I wanted to get rid of. Any insights where the best place to get rid of it? I’ve seen these places offering to buy. Thanks for doing the investing type posts. The first thing to do is check the current market price of gold (http://www.kitco.com/market/ is one place to do this). Then you have a couple of options. First, you can visit some local “we buy gold” shops to see what they’ll give you. It won’t be market price, but you can see what they’ll offer. Second, you can check with some of the online companies. 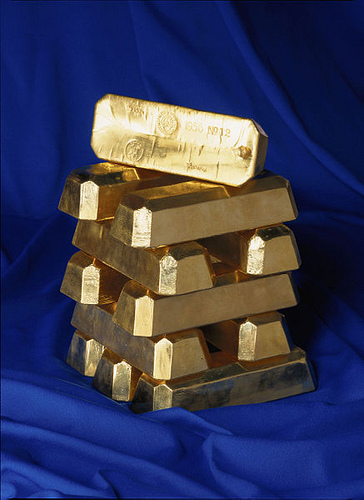 Dave Ramsey recommends Gold Stash, which speaks highly of them in my mind, but I’ve never personally dealt with them. Either way, be comfortable with what you’re being paid and how. The #1 best and eternal investment is our faith in Christ who is the creator of everything (Jn 1:3) who also happens to have unlimited resources (Eph 3:16). Make every effort to grow your faith in Him who can and will provide for your needs (because you are His beloved) (Matt 6:19-34) no matter the economic situation. Joseph and Job are excellent examples of how to trust in God even when you have lost everything. I pray God’s wisdom, peace, love, mercy and unmerited favor (grace) for you all! In our area, we’ve noticed pawn shops, jewelry stores, and “gold dealers” showing up everywhere begging people to sell their gold jewelry and such. If gold is so valuable right now, is it because they’re going to low-ball you to get it for next to nothing, so they can then sell it high? I’ve seen this trend all over the country. Every time I travel and especially in certain areas of towns, you can’t help but see the “BUYING GOLD” signs everywhere. The exact reason I’m not sure, but it definitely has to do with the desire by many to buy gold and like any pawn shop, they’re going to give you a VERY low amount and profit from it when they sell it elsewhere. This isn’t evil, but you will never get market value for something you sell to a pawn shop or similar. I suspect most of these shops will go out of business quickly if/when the bottom falls out of gold. If it keeps going higher, these will become bigger and bigger businesses. Thanks for sharing your insights and opinions with us all. I always wondered about some of the very issues you brought up here. Good point about past examples of crisis situations. Thanks, Nicole. I really believe people get involved in the hype of “investing” in things and don’t consider what they’re really getting themselves into.